History is coming alive in Kentville! Not just through books or dusty artifacts, but through the voices of past generations. These words came from one of the participants in the Kentville Historical Society’s new oral history project, now nearing completion. This project, done in collaboration with Dr. David Duke, a professor in Acadia’s department of history, has opened the door to discovering history through the words of those who lived it. And thus began this exciting journey into the past! Fifteen seniors who had lived and worked in Kentville for many years were contacted by the Society to see if they were willing to participate in the project. It was an overwhelming response! The list was given to Dr. Duke, and he paired up his students with these seniors. After two interviews per person, conducted before the end of December, the result has been a total of 30 hours of digital audio, a first volume of 265 pages, and a second volume nearing completion. 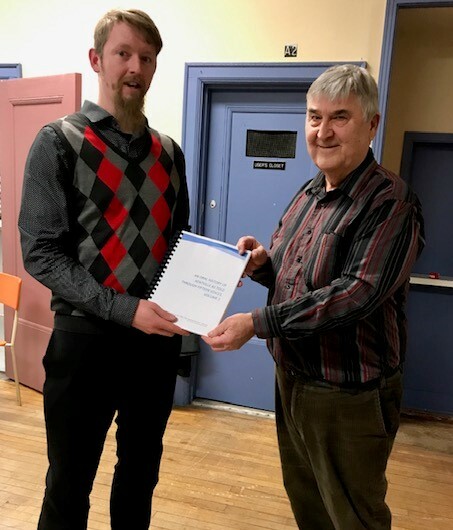 One copy of both the digital and printed version will be given to each of the interviewees for their own personal and family records, one copy of both will be available in the Kentville Historical Society’s Heritage Centre, and one copy will be housed in the Acadia Archives. At a recent presentation to the Kentville Historical Society’s members and interested public, several of the students spoke about what they had discovered about history through their participation in this project. One student told us, “before taking this course, I perhaps hadn’t thought of asking my grandparents about their lives.” The students have discovered a new appreciation of everyday memories of everyday people. There are more voices, with more stories to be told, and we cannot let our older generation slip away without sharing their life stories. This is just the first installment of our oral history project in Kentville. Stay tuned for more stories of Kentville’s unwritten history in the coming months. The next meeting of the Kentville Historical Society will be Tuesday, April 9 at 6:30 pm, upstairs in the Kentville Recreation Centre. The guest speaker for the evening will be Tom Calkin, who will talk about the history of the Calkin family and their role in Kentville’s history. Everyone is welcome to attend!